Many of my friends were asking me about which picture that got me a chance to shake hands with Mayor of Kuching City South. As I have stated earlier in another posting, that the competition was organized by SPAS & Permanis Sandilands Sdn Bhd (Pepsi). The theme basically was "The Joyful Moment With Pepsi Photography Contest at Kuching Festival Food Fair", obviously in conjunction with the annual Kuching Festival Food Fair. Shooting period was from 1st August to 15th August 2010. Submission date was 16th August 2010. We went to the Kuching Food Fair on 14th August, then there was go-kart shooting on 15th. Which left me near to no time to select and print the photos. Anyways in the end I did manage to print it and submit it all on time 3pm to Pearl Studio (thanks Jonathan). That is a very nice certificate, good print quality. Thumbs up Jonathan ! Group Photo by http://www.micphotography.com.my/ 2nd Prize Photo by http://www.spas.com.my/How about 2008? Well I did join something it was a long shot but I just joined for fun, it was organized by JPS. They got my name wrong ! So 2008, 2009, 2010. Got to try harder next time! So its 2007, 2008, 2009, and 2010. Hopefully more to come? Two Saturdays ago, I received a call from Pazuzu, he said that there will be a dance competition event at The Spring. I didn't know much and I didn't have much to do so I went for the event. Actually prior to that Saturday we, about 10 photographers gathered at Kluang Station, to try and snap the event. But the it was postponed to Saturday. Then on Saturday, not knowing when exactly is the time of the event, me and Steven arrived at 4pm and we sat around till it was 6.00pm, when the event started. Silly us. Pazuzu joined us at 4.30pm, and then Steven decided to go home to take a shower. So there was only myself and Pazuzu shooting the event. The funny thing was his Canon 50D ran out of power, as we were playing with it for the whole afternoon. And he only had one battery!!! I don't know why, but it was bloody hilarious. He was shooting the opening act, then 2-3 frames later he told me he was out of power! hahaha~ poor fellow. It was a bit low keyed I must say but at least there are events like this rather than no event. Its always a good start to see young people (am I that old already?) showing their skills for the world to see. Before the event started everyone was shy to approach the stage. They were all standing a good 15 feet away. Even those who were participating in the event. Heh~ but as soon as the MC started to speak, everyone rushed to the front of the stage as if free ice cream was given or something. They were standing so close to the stage, till me and pazuzu cant really move or stand up, else we will be in people's view. There were six solo participants and one group participant. The two guys on the far left was the one and only group participant. Another two solo participant were late. This was one of the first contestants, not bad. Got tired after a while. This gal has some moves, playful. This dancer's energy was endless, good moves too! This dude got style~So I gave him 5 strobes. This two was brining down the house, old school style. Her dance moves were, I guess contemporary ? I dont now much about dance. This guy was, WOW. While his routine was not perfect, it was still very much the most entertaining solo performance of the day. Overall I think they should not have made it as an event, rather they should hire a pro, and do a demo with the other participants doing exhibitions and the pro would rate and award them accordingly. Instead, they gave the top prize according from crowd response. And 90% of the time, the crowd was not listening to the MC, as he was hidden at the side. Maybe if he had gone on stage it might have been better. There is a lot of room for improvement still, but I think the organisers should not give up! I see potential! FOR FULL GALLERY, CLICK HERE. yeah.. just came back from a short and hectic work trip to Kuala Lumpur. I went on Saturday (27-01-2008) by AirAsia and came back last nite on (29-01-2008) by MAS. I actually wanted to go over on Saturday, but I had a wedding reception to attend. Me and my colleague Darren flew from KCH, and another (Liong) flew from Miri. After reaching LCCT, we waited for Liong and then we headed down to Eastin Hotel. After checking in, I went to 1Utama with Siew Pao and Carey. Where I spent about RM 750.00 on clothing and shoes. :P yeah, never did I buy so much worth in one afternoon... in about 3 hours time. Oh well... there was a lot of sales going on, the items I bought ranged from 10% - 50%. On top of that, Siew Pao had like all discount cards to nearly all the shops there!! >.<" oh well. Then Jia Yong picked us up and we headed for dinner at Asia Cafe (?) I think thats wat its called, near Taylors collage Sunway area. Then it was back to the hotel! zzzzzz!! Next day it was work work work. We had a full day of training till about 4 pm. We got off early as we were missing some components so we could not do a hands on. =] We went to dinner with the bosses at a restaurant called Bali. Whole team turn up, about 30 over persons. Oh and thanks to Raymond who turned up with the Flash Diffusers, which we had gathered for purchase amongst our photo kaki's. After dinner a few guys and our operations manager went to get some beers at Hartamas. Incidentally met his friend and my gosh, they sure like to drink. Yes~ I admit, I puked. Heaps! =.= I still dont understand, fun mey like dat.. haha anyways got back to the hotel just before midnight, and crashed till about 2am, where my room mates from JB and PG came back. Chatted a bit and zz.. I started the day with a hangover. Had no appetite for breakfast, had half boil eggs, then we were in training / meeting whole morning. zzzz.... boringz.... den had lunch at 2pm. back to office and meeting some more. Our flight was at 8.40pm. So we arranged pickup from our hotel at 6pm. Luckily we hired a bigger taxi, those MPV type. As one of other region's rep didnt book and we had extra seat for him. But his room mate, was going to LCCT had not made arrangements, he had no ride. So I asked our taxi driver to call his office to arrange for one for the stranded rep. The taxi was there in less than 5 mins as there was one nearby. I guess it was not his luck cos the taxi picked up the wrong passenger. Well to cut the story short we got him another taxi which arrived much later, and in the end, he didnt make the flight and had to stay overnight. Sad. So we checked in. Had dinner, hanged around a bit and went to the boarding area. When I approached the area, I saw a familiar face. Tze Lei, was there reading a novel. haha. She was in PG then KL and was going back to KCH. We chatted a bit and boarded the plane. We had a delay as there was 2 missing passengers. And the crew had to unload their luggage. =] Another missed their flights. 1 hour 45 mins later we were back in KCH! My dad came and fetch me from the airport. And when I got home there was a package for me. 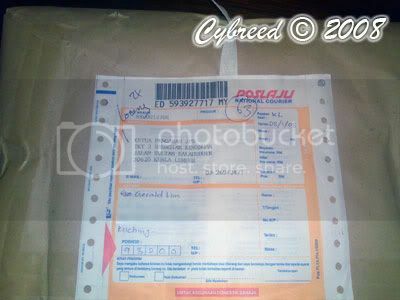 Hmmm... curious... upon closer inspection it was a package from JPS (Jabatan Pengairan & Saliran). Few months back I joined one of their competition introduced to my by Alex. So I open it up to find a beach towel and certificate. Oh yay... they got my name wrong. 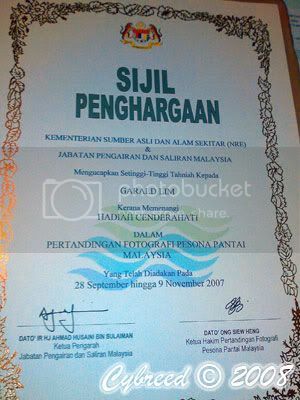 hahaha, it seems I have won the consolation prize for the Pertandingan Fotografi persona Pantai Malaysia. Check out the website at http://photo.water.gov.my. I guess its better than nothing. But why didn't even notify the winners at all. No letters of notification, how was the photos selected? by whom? where is it now? what will happen to it? Oh well at least I got a free beach towel~ w00t~!! !